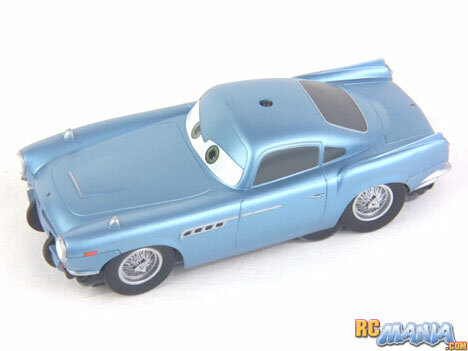 New for the Disney-Pixar Cars 2 movie release is this Air Hogs Zero Gravity series wall-climbing Finn McMissile model. This if the fifth distinct vehicle design in the long Zero Gravity series, and I've previously tested the Zero Gravity Micro, Zero Gravity Nano, and Zero Gravity Real Rides. The Finn McMissile version it most closely related to the Micro in both size and overall construction, but it adds a few newer features. First, from the Real Rides series, it has wheels and tires that appear to turn and have working suspension. I know it sounds odd to point out turning wheels on a car, but the four main wheels you see are really just for show -- they don't drive the vehicle at all. To actually move, the Zero Gravity cars have one small, skinny, sticky-soft tire on either side, which you can see most easily if you turn it upside-down. I'll show them in the video. To accomplish the feat of driving on a wall, there's a powerful suction fan that pumps out air from underneath the car to create a vacuum and make it stick to any surface. While the older Zero Gravity vehicles had a switch on the car that would go between normal driving mode and wall driving (turning the suction fan off or on), with the Cars 2 version you can now toggle the fan right from the controller. The last new thing with Fin McMissile is the inclusion of two extra wheels & tires at the front, protruding from below the bumper, and two on the rear. These are supposedly used to help the car drive from a table, right up onto a wall. We'll see how well that works out. The real fun begins when you drive from a table or other horizontal surface, up to a wall. You hit the "Wall" button on the controller, which activates the (very LOUD) suction fan, and then with a little back & forth nudging you can drive right up a smooth wall! This really impressed me, as I was skeptical about it being able to do it without a little ramp or a perfectly flush gap between the two surfaces. It went right up with little trouble at all, and I didn't have to touch it. I love it when things work as advertised! Again you need a smooth surface, but it doesn't need to be glass-smooth -- a little bit of paint texture seems to cause no trouble for the Finn McMissile Zero Gravity car. It drives just as well and just as fast on a wall as it does on the ground. For even more of a "wow," you can take the car from wall driving mode and stick it to the celing, driving upside-down. It won't drive from the wall to the ceiling, because the vacuum would be lost during the transition, but still, having a car that can drive upside-down is super cool. Just be mindful of the battery charge. When it starts to get low, the indicator light on the back of the car will start to blink. When that happens, you have less than 10 seconds to grab it, otherwise it'll suddenly turn off (to protect the batteries from being over-discharged). With no power, it'll fall right off the wall or ceiling. Again, just be careful. Impressive. That's the best way to describe the Air Hogs Cars 2 Finn McMissile Zero Gravity RC. It's the most advanced wall-driving toy RC to date, and it does everything it's supposed to well. The only thing that's not so great about it is the price. As of this writing, it's about $40 in most stores, though you may be able to find it on sale for a little less. That's a lot of money for a car this small and slow. It's still a bit of a technological marvel, though, and I don't know of anything quite like it. Spin Master has made another solidly high-quality Air Hogs product here.